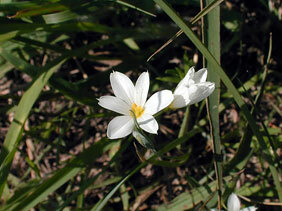 Also Called: Prairie blue-eyed grass. Stems: Tufted, erect, flat, slender, leafless, unbranched, waxy, with 2 edges or narrow ridges called "wings". Leaves: Basal, narrow, grass-like, 3 to 10 inches long, less than 1/10 inch wide, pale green, glabrous, waxy, tapered to sharp points. Inflorescences: Umbel-like clusters of flowers on thread-like stalks, terminal; sheathed at base by 2 bracts, erect, overlapping, green to dull pinkish purple, outer bract 1 to 2 inches long, inner bract somewhat shorter; tips pointed. Flowers: Wheel-shaped, star-like, white to pale blue, centers yellow; perianth segments 6, less than 1/2 inch long; tips with short, awn-like points; stamens 3, united, anthers orange. Fruits: Capsules, spherical, less than 1/5 inch across, 3-chambered, green to brown; seeds many, smooth or slightly pitted, black. Habitat: Upland prairies and infrequently open woods. Uses: Some Native American tribes treated stomachaches and hay fever symptoms with a tea made by boiling white-eyed grass. Comments: The common name is a misnomer because this plant is not a grass. It is a member of the Iris Family.